The data for this example are taken from Gilmour, Anderson, and Rae (1987) and concern the foot shape of 2,513 lambs that represent 34 sires. The foot shape of the animals was scored in three ordered categories. The following DATA step lists the data in multivariate form, where each observation corresponds to a sire and contains the outcomes for the three response categories in the variables k1, k2, and k3. For example, for the first sire the first foot shape category was observed for 52 of its offspring, foot shape category 2 was observed for 25 lambs, and none of its offspring was rated in foot shape category 3. The variables yr, b1, b2, and b3 represent contrasts of fixed effects. The number of observations that share a particular response and covariate pattern (variable count) is used in the FREQ statement. The S and CL options request solutions for the sire effects. These are output to the data set solr for plotting. The "Model Information" table shows that the parameters are estimated by maximum likelihood and that the marginal likelihood is approximated by Gauss-Hermite quadrature (Output 44.11.1). The GLIMMIX procedure is modeling the probabilities of levels of Shape having lower Ordered Values in the Response Profile table. The distribution of the data is multinomial with ordered categories. The ordering is implied by the choice of a link function for the cumulative probabilities. Because a frequency variable is specified, the number of observations as well as the number of frequencies is displayed. Observations with zero frequency—that is, foot shape categories that were not observed for a particular sire are not used in the analysis. The "Response Profile Table" shows the ordering of the response variable and gives a breakdown of the frequencies by category. With METHOD= QUAD , the "Dimensions" and "Optimization Information" tables are particularly important, because for this estimation methods both fixed effects and covariance parameters participate in the optimization (Output 44.11.2). For GLM models the optimization involves the fixed effects and possibly a single scale parameter. For mixed models the fixed effects are typically profiled from the optimization. Laplace and quadrature estimations are exceptions to these rules. Consequently, there are seven parameters in this optimization, corresponding to six fixed effects and one variance component. The variance component has a lower bound of 0. Also, because the fixed effects are part of the optimizations, PROC GLIMMIX initially performs a few GLM iterations to obtain starting values for the fixed effects. You can control the number of initial iterations with the INITITER= option in the PROC GLIMMIX statement. The last entry in the "Optimization Information" table shows that—at the starting values—PROC GLIMMIX determined that a single quadrature point is sufficient to approximate the marginal log likelihood with the required accuracy. This approximation is thus identical to the Laplace method that is available with METHOD= LAPLACE . For METHOD= LAPLACE and METHOD= QUAD , the GLIMMIX procedure produces fit statistics based on the conditional and marginal distribution (Output 44.11.3). Within the limits of the numeric likelihood approximation, the information criteria shown in the "Fit Statistics" table can be used to compare models, and the –2 log likelihood can be used to compare among nested models (nested with respect to fixed effects and/or the covariance parameters). The variance of the sire effect is estimated as 0.04849 with estimated asymptotic standard error of 0.01673 (Output 44.11.4). Based on the magnitude of the estimate relative to the standard error, one might conclude that there is significant sire-to-sire variability. Because parameter estimation is based on maximum likelihood, a formal test of the hypothesis of no sire variability is possible. The category cutoffs for the cumulative probabilities are 0.3781 and 1.6435. Except for b3, all fixed effects contrasts are significant. 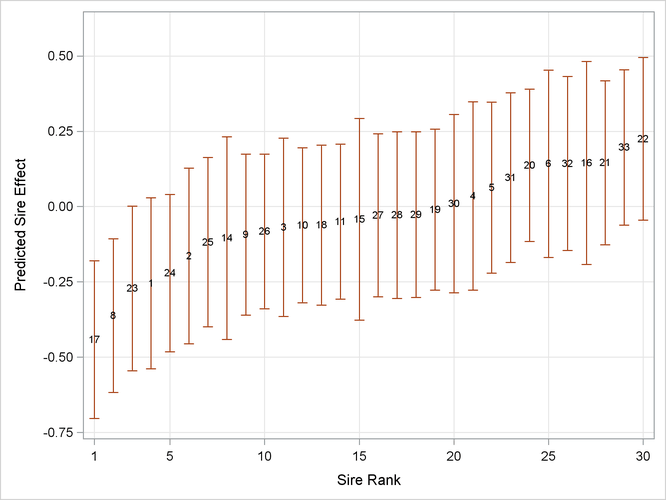 which compares the fitted model against one where the sire variance is fixed at zero. The –2 Log Likelihood in the reduced model without the sire effect is 3915.29. Compared to the corresponding marginal fit statistic in the full model (3870.12), this results in a chi-square statistic of 45.17. Because the variance component for the sire effect has a natural lower bound of zero, PROC GLIMMIX performs the likelihood ratio test as a one-sided test. As indicated by the note, the p-value for this test is computed from a mixture of chi-square distributions, applying the results of Self and Liang (1987). There is significant evidence that the model without sire random effects does not fit the data as well.